Like previous years, the National Textbook Festival was celebrated at all primary and secondary level educational institutions across the country on January 1. 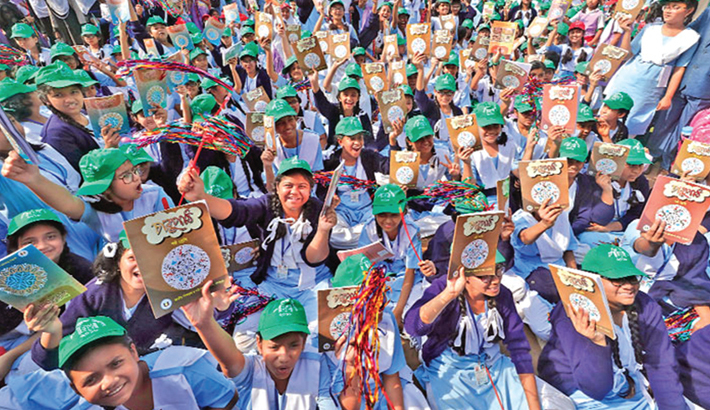 Prime Minister Sheikh Hasina formally inaugurated the free textbook distribution programme for the academic year 2018 on Monday. Reportedly, this year free textbooks is being distributed among 35,42,90,162 pre-primary, primary, secondary, ibtedayi, dakhil, dakhil vocational, SSC vocational, small anthropological group and visually challenged students across the country. Education Minister said, the government has printed 10.70 lakh more books for the students of the 2018 academic year compared to that of last year. The government has been distributing free textbooks on the very first day of the New Year since 2010. The programme has sparked great interest among students. The first day of a New Year is usually a delightful day, but for the primary and secondary students the day is doubly joyous for having new books in hands. Starting a new academic year with a festive mood will definitely have positive impact on the students’ academic life. They will become more engaged and attentive in the classroom. More importantly, it will help develop reading habit among students. Nahid also said: “This festival is the outcome of our sincere commitment to reach textbooks to the students on the first day of the year and it has reduced the rate of school dropouts and increased the number of students at primary and secondary levels. In this age of digital distraction, a whole generation is growing up preferring facebook over books. These social networking sites are so pervasive that an online post titled “facebook is my real book” generated immense interest among young users! So, they can hardly put down the phone or turn off the laptop. While continuously surfing online, young generation in particular, is falling prey to online propaganda. In the process, their young mind is being tainted, resulting in the deviation of young generation. On the other hand, as the people are perpetually busy with facebook and other similar tools, the role of book is fast shrinking. So, there is a need for reinvigorating reading habits among students. Textbook festival is a good step forward in this regard. But we must not keep students limited to a few selective textbooks. They should be encouraged to read extra curricular books as well. For students with a reading habit, who reads series of books besides text curriculum, are capable of doing well at reading, writing, vocabulary and spelling. They develop a reading stamina and possess deep background knowledge. This is the value we need to stand for. Wise men called books as their best friend. However, friendship with books is necessary for all of us to have a clear understanding of the world we live in.